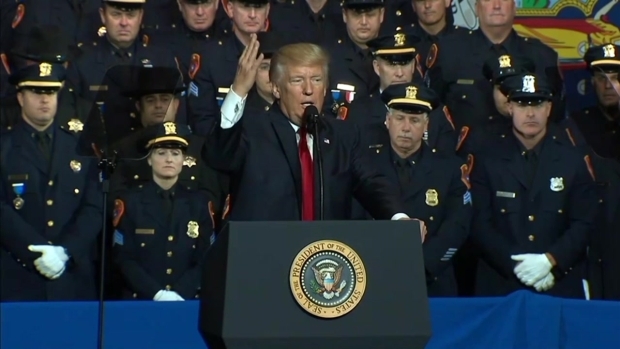 President Trump targets MS-13 during his Long Island address. Greg Cergol reports. 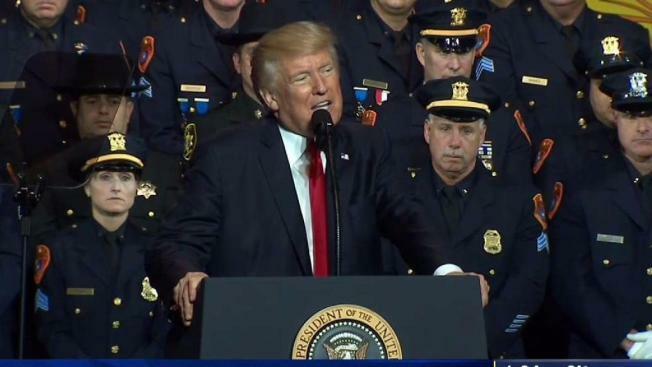 President Donald Trump visited Long Island Friday to highlight administration efforts to crack down on illegal immigration and violent crime, and in particular the violent MS-13 street gang that police say is responsible for the murders of 17 people here in the last year and a half. Trump spoke at Suffolk County Community College in Brentwood, where protesters awaited his arrival with chants and speeches. "Few communities have suffered worse at the hands of these MS-13 thugs than the people of Long Island," he said to a receptive audience that included federal and local law enforcement personnel. MS-13 gang members "have transformed peaceful parks in beautiful neighborhoods into blood-stained killing fields," he said. "They're animals." 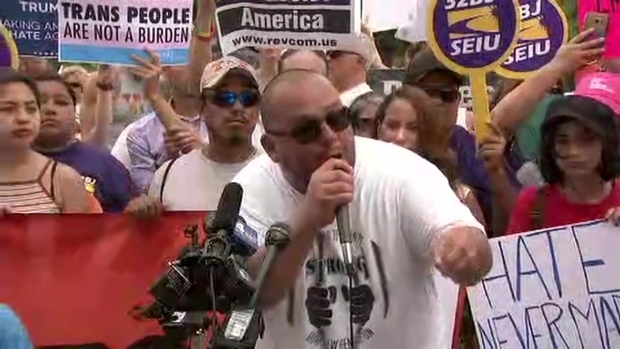 Protesters and supporters gathered as Trump talked about gangs and illegal immigration. Marc Santia reports. Trump promised his administration would "dismantle, decimate and eradicate" MS-13. "We're getting them out," he said. "They're going to jails and then they're going back to their country, or they're going back to their country period." He also appeared to advocate rougher treatment of people in police custody, speaking dismissively of arresting officers who protect suspects' heads while putting them in police cars. He said: "You can take the hand off," drawing cheers from his audience. Trump also claimed that laws are written to "protect the criminal" and "not the officers." President Trump will meet with parents whose children were killed by MS-13 gang members on his visit to Long Island Friday. Katherine Creag reports. He told the law enforcement officials that the "laws are stacked against you" and need to be changed. Before Trump arrived at the Long Island college, dueling protests took place outside the college. One group stood in support of immigrants, holding signs and chanting things like, "Money for jobs and education, not for mass deportation." A smaller group rallied in support of Trump, holding Trump flags and signs reading "We support the President." Blanca Villanueva, a lifelong Brentwood resident and advocate for public school education, accused Trump of "using our tragedy for political gain, to fuel his hateful agenda." One pro-Trump demonstrator rallying on the other side held a sign reading "Stop immigration" and used a bullhorn to curse and broadcast disjointed insults. He was quickly drowned out by protesters who chanted in response, "This is what democracy looks like." Evelyn Rodriguez and Freddy Cuevas, the parents of 16-year-old Kayla Cuevas, one of the young people allegedly killed by MS-13, were seated in the front row of Trump's speaking event, having been personally invited to hear him speak. Rodriguez told News 4 Friday morning she was nervous but excited to see the president, and she wants to make sure he will support Suffolk police and leadership in fighting gang violence. She'll also call on him to bring back funding for community programs to support kids and for public schools. "We want to see changes," she said. Congressman Peter King, who represents Brentwood and traveled with the president from Washington, said Trump's appearance would send a signal to communities that have been shaken by the violent killings. "It's absolutely devastating. And almost all of these killings have occurred in my district, within 20 minutes of my home," he said. Immigrant advocates on Long Island have accused the president of politicizing the MS-13 gang problem to justify a crackdown on all undocumented immigrants. Although Trump’s visit to the island was not met with complete support, law enforcement officials have said they were looking forward to it and were "extending a warm welcome" to the president. Trump chose Long Island to push forward his agenda because the senior administration official said the president believes Suffolk County is the epicenter of the MS-13 threat. Police officials say that since Jan. 1, 2016, there have been 17 murders by MS-13 members in Suffolk County, many of which have been in just two neighboring suburbs, Brentwood and Central Islip. Some victims were high school students whose remains turned up months after they vanished, hidden in wooded areas or found on the grounds of an old psychiatric hospital. The deaths began to get attention after best friends Nisa Mickens, 15, and Kayla Cuevas, 16, both students at Brentwood High School, were beaten and hacked to death in September by a carload of gang members who spotted them walking down the street. Investigators said Cuevas had been feuding verbally with gang members. 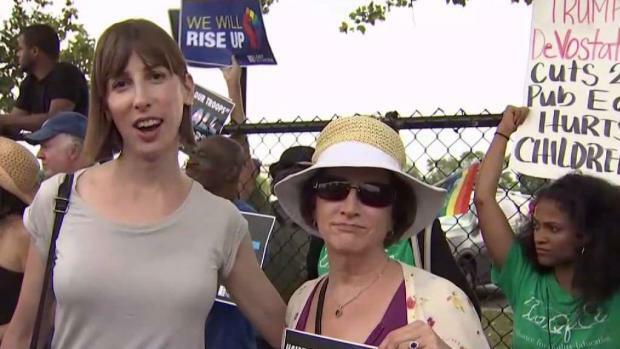 Protesters were out in force on Long Island Friday ahead of President Donald Trump's visit to Suffolk. Cuevas' mother told News 4 in tears Friday, "Kayla used to tell me in anything I was doing, 'Mom, I always got your back.' So I know up in heaven, she really does have our back." In April, three teenagers and a 20-year-old man were massacred in a park in Central Islip. Prosecutors said they were lured to the park and then ambushed by at least a dozen MS-13 members wielding machetes and other weapons. One person escaped. Prosecutors said they were marked for death because some were suspected of being rival gang members - something their families denied. Twenty people have been charged publicly in eight homicides in recent months. They include five people accused in the deaths of Mickens and Cuevas and 10 people in the Central Islip massacre. All but a few of those charged in the deaths were citizens of El Salvador or Honduras who entered the U.S. illegally, according to law enforcement officials.